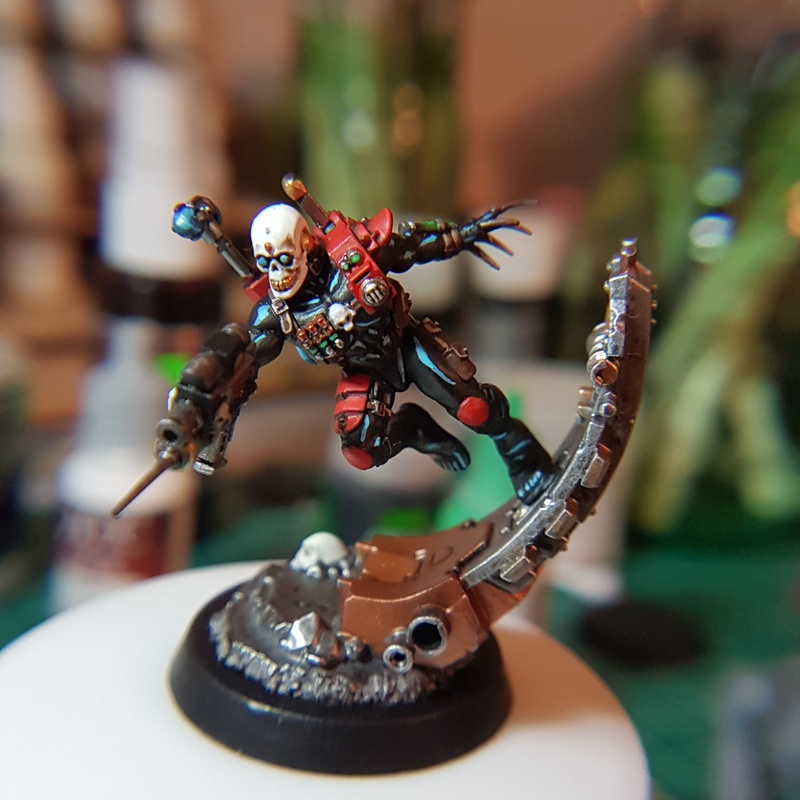 Another entry, another completed Imperial assassin. 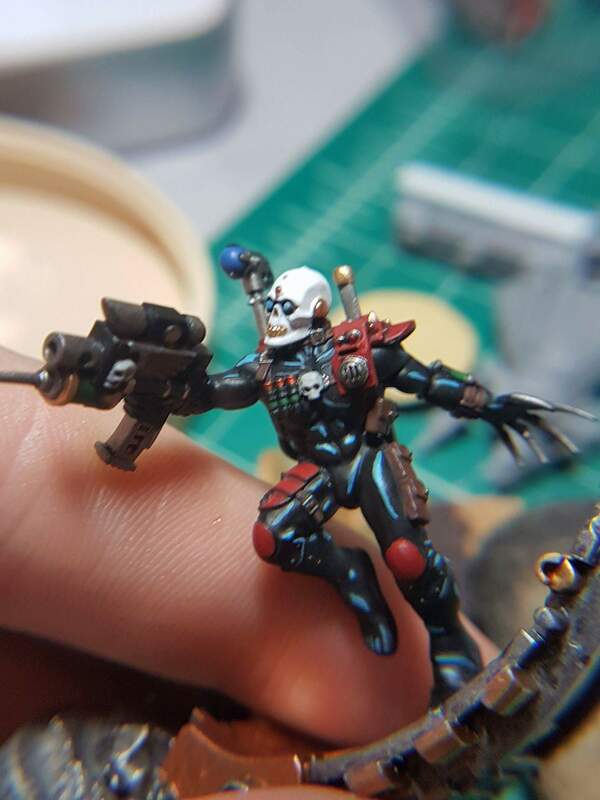 With the release of the Imperial Agents codex there is now a convenient single source for the Assassins, as well as providing a player like me who doesn’t have an extended history of 40k with the Inquisition material. 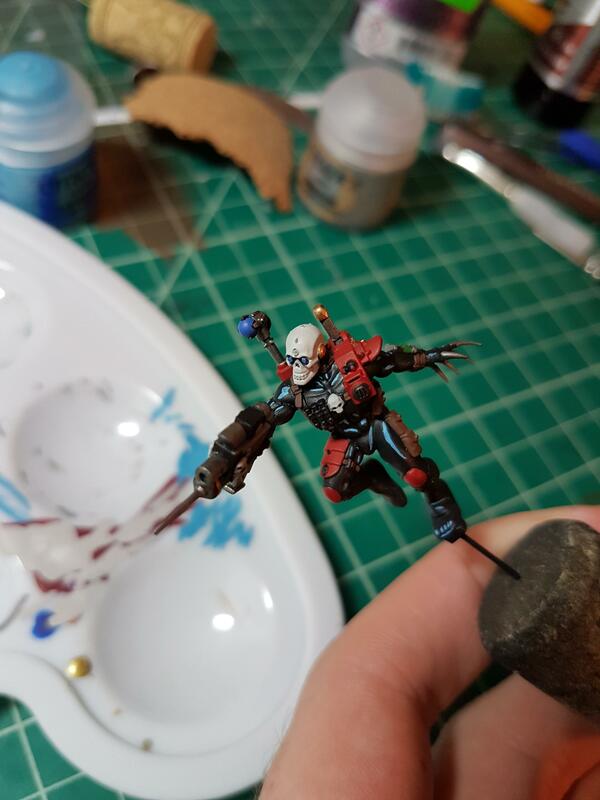 After getting a few games in with the Culexus I realized that I really wanted to get a more combat oriented, generalist assassin. 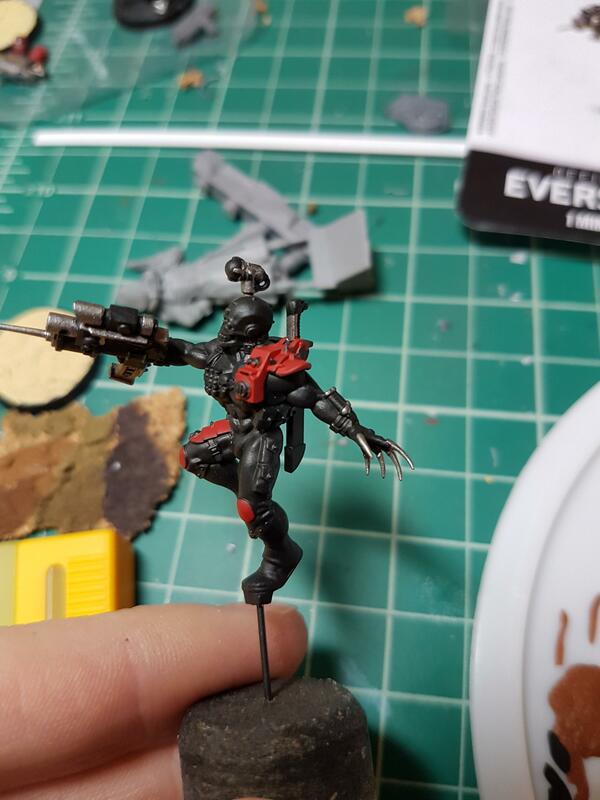 Most of my armies are pretty adept on shooting so the Vindicare was out, and I am personally not a big fan of the Callidus sculpt so that leaves the Eversor. Construction was pretty straightforward, and once again I assembled and primed the main body separate from the provided platform just like with the Culexus. 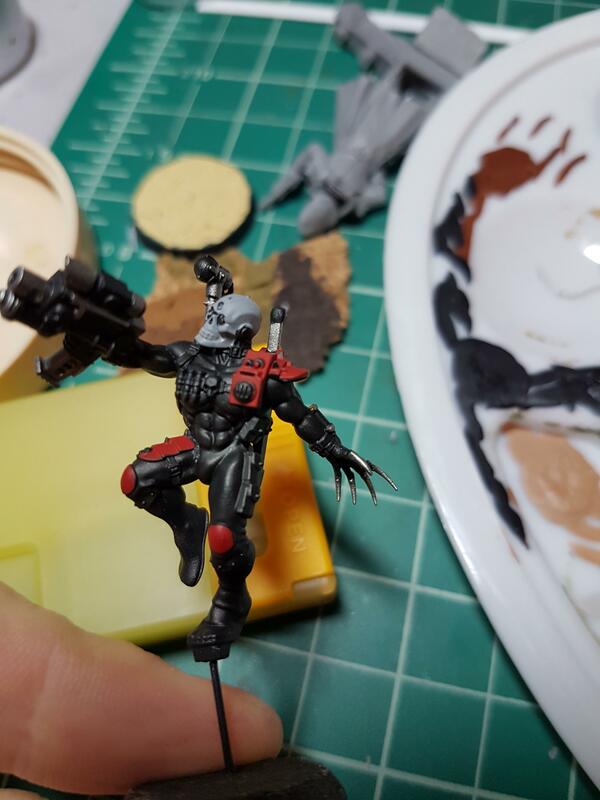 I primed the figure with Chaos Black and got to work. First base colors were Mephiston Red and Leadbelcher for the metallic portions of the claws, vials and bolter. 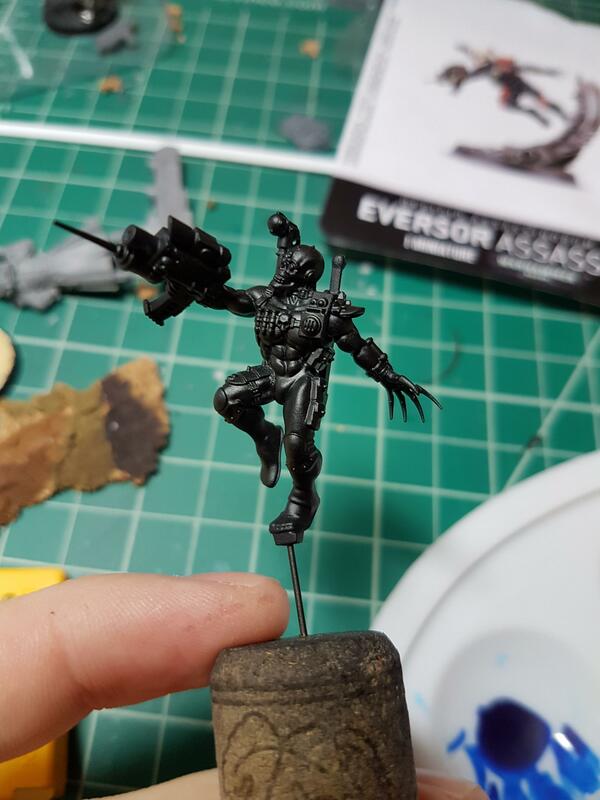 This figure gave me an opportunity to hone my ability to work up from flat black to white. One of the best pieces of advice that I got was to thin down my intermediate layers to a consistency that would allow me to place a drop of the paint, beaded on the surface. Then, I would carefully place my brush in the drop and slowly drag it around the surface that I wanted covered. 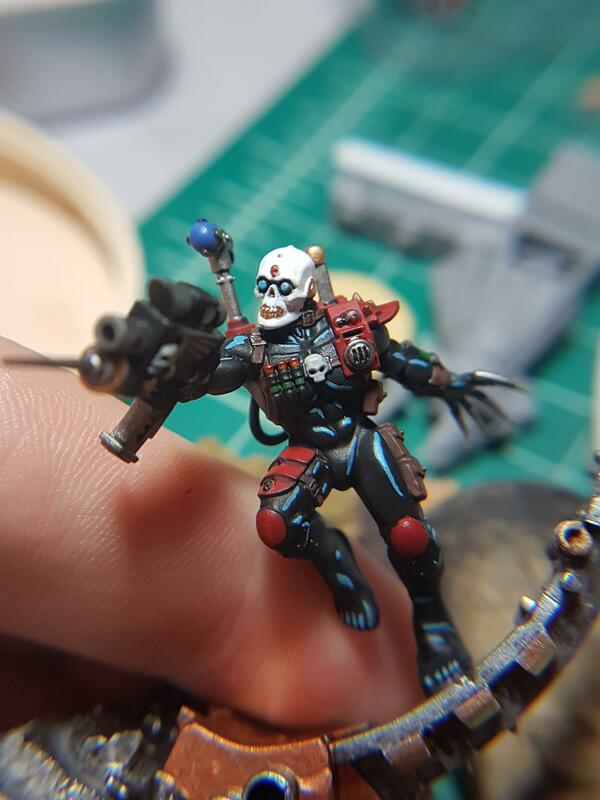 Here you can see the weather now based, as well as the skull now build up to Vallejo Deck Tan, which I have found to be an ideal last layer before going to the final white. Layering the white in this fashion takes quite a bit of time to dry, and so I took the time to paint on the same Lothern Blue highlights that I had done previously. And here you can see him with more work done. The white is worked up to its final layer of Vallejo Bone White, and the bolter has ore layering work done. 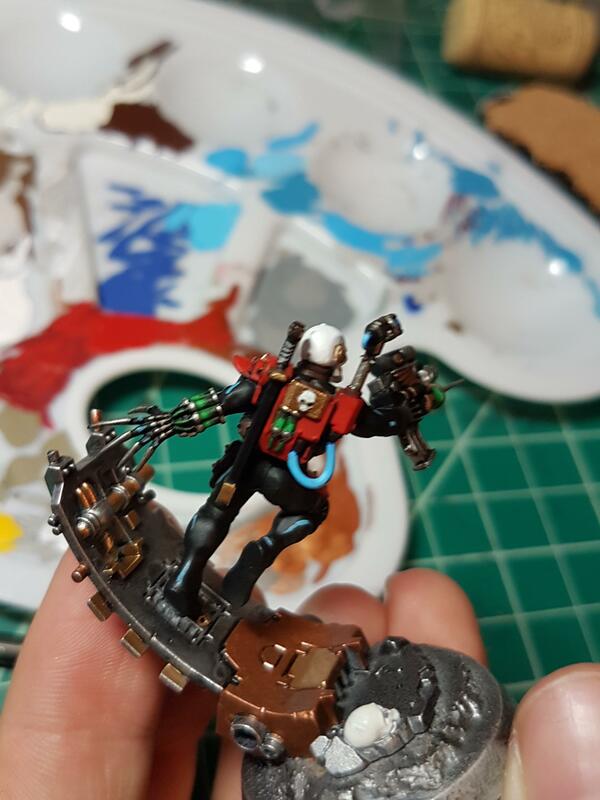 A layer of flat green has been applied to all of the poison bolt and vials, while Hapshut Copper was used on the wings of the bolter and the shells on his chest rig. His platform was then done with a layer of Vallejo Liquid Gold on certain portions, while the remainder were done with Hapshut copper. 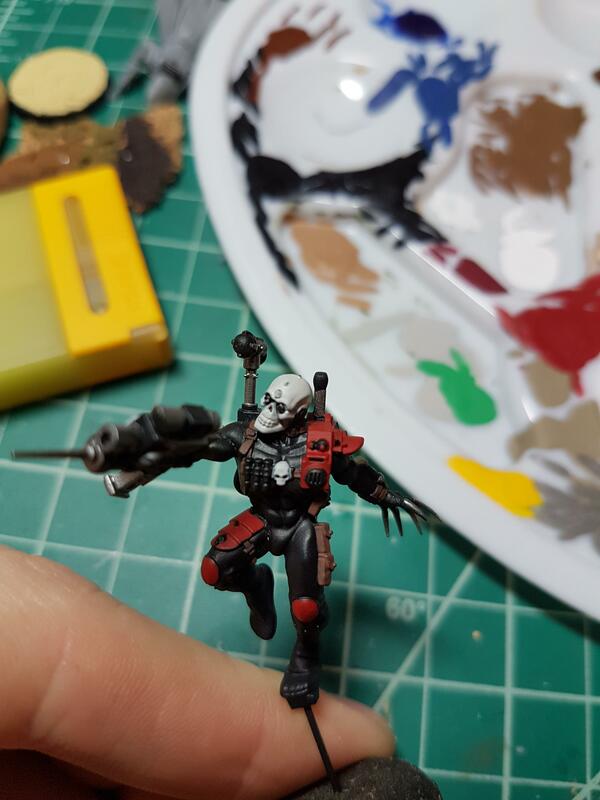 The teeth of the ebony mask was given as light of a coat of Vallejo Old Gold as I could manage, and the red potions were given a light wash with Nuln Oil. The teeth were given a light wash with Agrax Earthshade, then a light highlight with the original gold color. I then cleaned up the area around the mouth with white. 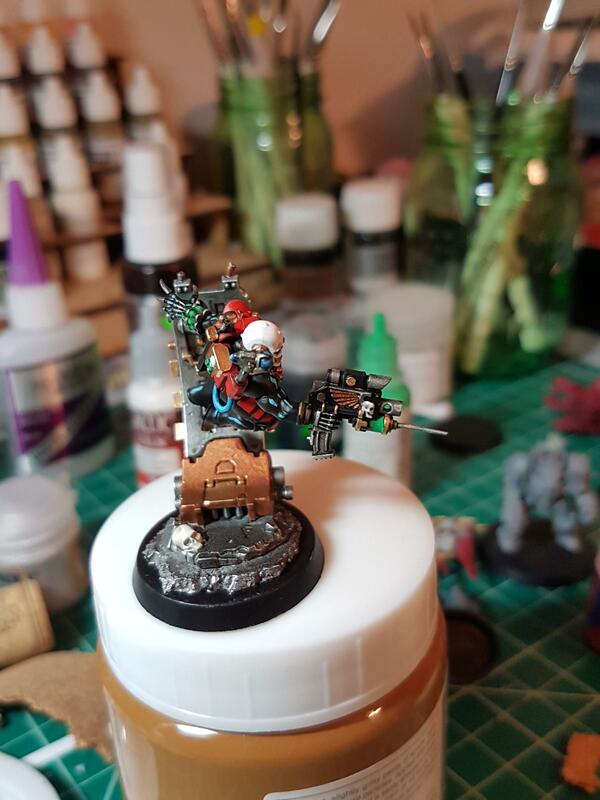 I painted the skull on the base in the sea way that I did the helmet, and the vials were given a second layer of Vallejo Bright Green to attempt to paint a liquid effect of the vials. All of the raised silver portions were dry brushed with stormhorst silver. Edge highlighting was done on the Mephiston Red portions with a mix of Troll Slayer Orange and Evil Sunz Scarlet, and then glazed with Bloodletter. The final step was to paint all of the silver portions on the base black, and that is where I finished for now. I intend on working on the final base portion later, but because of a little move across the country my hobby stuff has kind of stalled for now. Until next time.